Sixth chakra meditation focuses on the Ajna or third eye chakra, the chakra of perception, imagination and visualization. It is the seat of our inner voice or conscience as well as our "sixth" sense. That is why, it is often referred to as the psychic chakra. Ajna in Sanskrit means "command" or "summon." Ajna chakra is located at the centre of the forehead, in-between the brows and just above the brow line. It is at the junction of the three nadis or energy channels - ida, pingala and sushumna - thus making it a particularly important chakra. Another not so well-known name for the chakra is jnana-padma or 'knowledge-lotus.' It bestows upon you the wisdom to act rationally and without judgment and it helps you "see" and plan for the future. The traditional element associated with the sixth chakra is called mahat, meaning supreme, a culmination of all the elements into one. But it is easier to think of the associated element as 'Light,' without which the 'third eye' would be unable to 'see' or perceive things. The color of the chakra is Indigo while a lotus with only two petals symbolizes the chakra. Ajna chakra controls the eyes, nose, pituitary gland, pineal gland and the base of your skull. An unbalanced chakra could lead to headaches, nasal congestion, vision problems, sinus infection, poor memory and even insomnia. Lack of imagination and intuition result in poor decision making and self-deception. On the other hand, overactive imagination due to an overloaded chakra can lead to hallucinations, disconnection from reality and psychosis. 'Living in your head' can be a serious problem indeed. The following sixth chakra meditations will help you activate and balance your third eye chakra, which many yogis believe to be the easiest chakra to rouse. 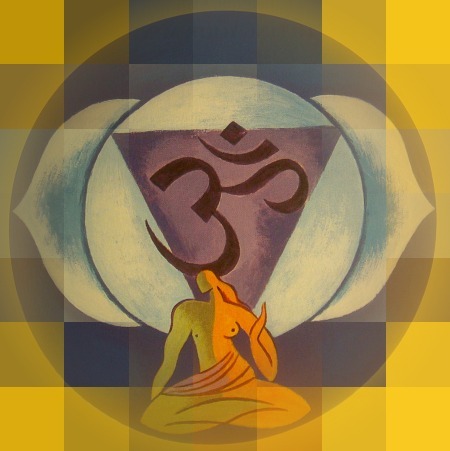 The beej sound or mantra of the Ajna chakra is the primordial sound, OM. Chanting OM helps activate the chakra. Tratak meditation promotes intense concentration and at the physical level, aids cleansing of the eyes, tear ducts and sinuses. Sixth chakra meditation not only activates the Ajna or psychic chakra, but also encourages balance in the lower chakras. Listening to guided instructions, as provided in third eye chakra guided meditation, can be an easier way of doing sixth chakra meditation.